This is not a review ! Came this morning , @ 64mm EDF . B) Tightening the blades to the motor shaft , nope .. Really hard to achieve ..
C) EDF body is a little flimsy , you really need the induction lip glued in place ..
D) Vibration ! , traced back to the nose cone .. 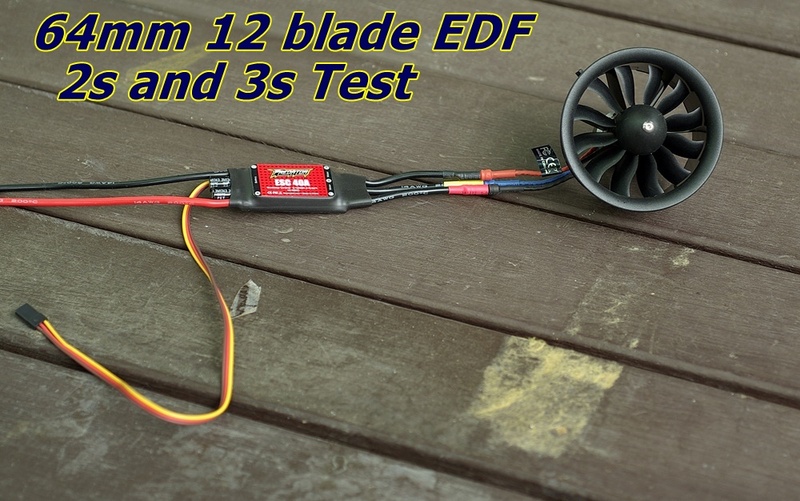 Using my Predator 40A ESC I saw a full 40A and then some at full power .. It really has some thrust at this power level .. Thrust starts at about 5A and by the time you get to 10A there is decent thrust . At 15A the thrust is getting serious .. At 40A the thrust is very impressive to this EDF noob . At 40A there was no cooking , but there was some warmth ..
At maximum power I saw some 26A and the thrust was impressive . I honestly dont see why this combo could not work on 2s .. Ok you wont break any speed records but you will most likely not cook anything either and still have decent flight performance . Obviously model weight will dictate performance . Wow , my first EDF .. I have thread locked everything . I had problems tightening the fan blade to the motor shaft , just kept slipping on the shaft rather than tightening . Some thread locker on the motor shaft seems to have cured the slipping problems . At the moment everything seem to be button down rather well , and I did order some cheap models from HK that I hope will EDF successfully . These will be 2s as I don't see the need to run more battery .